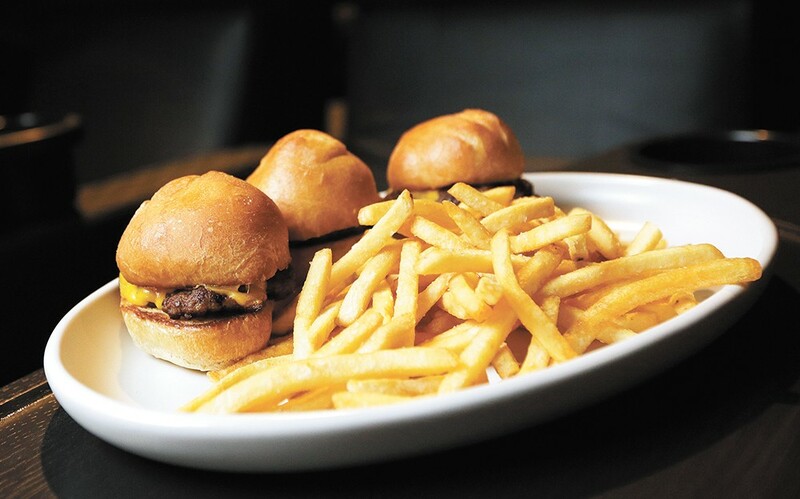 Sliders from the "dark menu." At the Inland Northwest's newest cinema complex, hungry filmgoers don't have to rely solely on popcorn, soda or sugary concessions to sate their appetites through a two-and-a-half-hour blockbuster. Movie & Dinner, the newly opened eight-screen theater at Northern Quest Resort & Casino in Airway Heights, eliminates some of the stressful decision making that can arise when planning a classic dinner-and-a-movie date night: To eat before or after? Where? What if the restaurant is really busy — will we make our showtime? The new restaurant-cinema hybrid serves food not only in its attached dining room and bar, but also straight to cinema-goers' cushy auditorium recliners. "You hear a lot in the [movie theater] industry of expanded concessions, and we're realizing how important the food element is. We characterize ourselves as a restaurant first, with auditoriums," says co-owner Spencer Jacobson, who opened Movie & Dinner with his father, Larry Jacobson, after being approached by Northern Quest about adding a theater to its resort amenities. The father-son duo own and operate CineGenesis, a Kansas City, Missouri, based cinema consulting firm. Movie & Dinner is the first venue of its kind for the company, and one the Jacobsons plan to replicate in other cities. "We emphasize the food, but even if you want to see just a movie and not order the food, we think it's the best exhibition in the country," Jacobson continues, referencing the seating configuration — there are "no bad seats," he adds — and the high-quality audio-visual technology in each auditorium. On the food side, Movie & Dinner offers two separate and somewhat overlapping menus. Traditionally plated entrees and appetizers are served in the dining room, while the "dark menu" offers more casual, theater-friendly food for customers ordering from their seats. 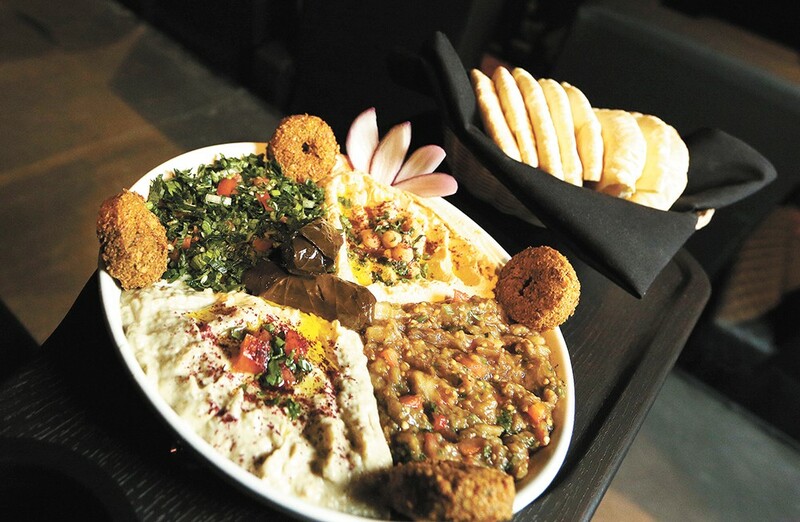 Movie & Dinner's Middle Eastern platter, served in the restaurant. Both menus are expected to change and evolve to meet customer demand and preferences, as well as to logistically work in a kitchen that's essentially cooking for a 600-seat restaurant when all tables, theater seats and the lounge are accounted for. In the theater, for example, most of the food is handheld. Personal pizzas ($10), sliders ($10), sandwiches ($7) and tacos ($10-$12) make up the bulk of dark menu entrees as of opening week. There's also a Greek salad ($10), hummus plate ($7), shrimp cocktail ($9) and potatoes verde ($7). Dessert, served on both menus, is a New York-style cheesecake ($6). Dark menu food is served on traditional dinner plates, but with sturdy and compostable cornstarch-based utensils to prevent silverware clanking. During a show, the auditorium's overhead lights are kept at a non-distracting low level so diners can see their food. "There is no coordination or shuffling of food, and it's not going to drip on you or make a mess. It's all really simple foods, and they're quick and hot and delicious," Jacobson notes. Orders are placed in the theater by pressing a small button on a swivel tray table at each seat. Servers then quietly stop by to take orders via a point-of-sale system tablet. Run your card once at the beginning of the show, and keep adding to your tab if you need more snacks, drinks or popcorn. Tabs started in the bar or restaurant can travel with you into the theater, as can already-ordered drinks or food, Jacobson says. To simplify the checkout process, Movie & Dinner doesn't allow tipping, even for traditional tableside service. Several of the dark menu items are also served in the restaurant dining room, in addition to Kansas City-style barbecue (pulled pork or ribs; $10-$14) with sides of mac and cheese and baked beans. There's also a shrimp scampi ($15), grilled salmon ($18), and a few Middle Eastern-inspired dishes of chicken kabuli ($15) or a platter of falafel, baba ghanoush, pita, hummus and tabouleh ($17). All dishes on both menus are made from scratch, including the pizza dough, sandwich buns and cheesecake. "We want a nice place to come and have dinner, bring the family, get a drink and you don't have to see a movie," Jacobson says. "We joked when we hired our chef, 'Your job is to make the restaurant good enough to have people come and not see a movie.'" Keeping the pricing of its food and drink items reasonable was also an important consideration for Jacobson and his father, who understand the luxury expense entertainment can be. "It's nice to enjoy a movie and have a nice reasonable meal. You shouldn't have to pay $10 for popcorn," he says. Movie & Dinner is located on the south side of Northern Quest's main casino campus and is accessible via a new traffic intersection on Hayford Road. It's free to park in a large lot adjacent to the theater. Parents on a date night can also arrange to have their kids supervised at Northern Quest's new Kids Quest activity center across the street. The venue's eight auditoriums vary in capacity, from as small as 25 seats up to 89 seats in the two largest. Two midsize auditoriums each contain 73 and 48 seats. In the dining room, bordered by two-story-high windows, seating is a mix of high-backed booths and traditional tables. In the center of the building is the large square-shaped bar. Self-order concessions can be purchased just beyond the bar by those who want to have their beverage — all drinks from the theater's Coke Freestyle fountains are served in 32-ounce cups ($3.25) with free refills — and popcorn ($5/medium; $6/large) in hand as soon as previews roll. Movie & Dinner plans mostly to show first-run films, but the Jacobsons hope to slip in the occasional indie or cult classic. Auditoriums can also be rented for private events. Already underway is discount admission on Tuesdays, offering tickets to any film for $6. Regular admission runs $10 for a matinee and $12 for evening showtimes. Seniors, military, students, kids and Kalispel Tribe members get $2 discounts on all tickets. Jacobson encourages all guests to buy tickets online before heading out to the theater, since all seating is reserved, and auditoriums are likely be at capacity for popular films and during peak times. A low number of pre-ordered tickets is partly what led to Movie & Dinner's rocky opening weekend, when the restaurant ran out of many menu items and also found itself short on waitstaff. Still, Jacobson is optimistic and energized by the positive feedback he's received so far. The original print version of this article was headlined "Lights, Camera, Dinner!"